Benadryl can be used for dogs who suffer from allergies if proper dosage guidelines are followed. The most common active ingredient in Benadryl is diphenhydramine, which blocks histamine uptake, relieving inflammation and other allergy symptoms. 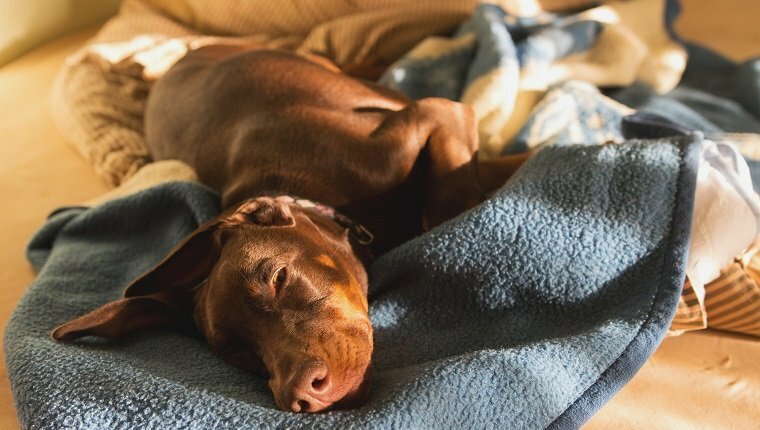 Diphenhydramine is also the an active ingredient in sleep aids and is relatively safe for dogs with veterinary guidance. 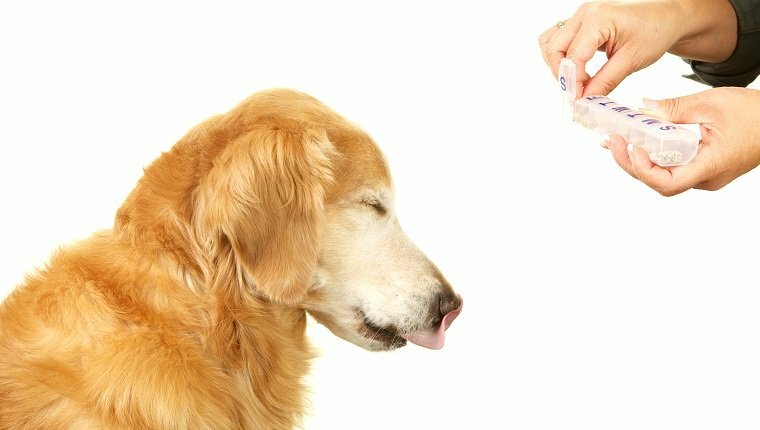 You should always consult your veterinarian before giving your dog any medication, including Benadryl, to find out what dosage is appropriate, as well as potential side effects that you should be aware of. Veterinarians often recommend Benadryl for dogs with allergies, as it can reduce their symptoms. Here is what you should know about Benadryl and it’s uses for dogs. Benadryl is an over-the-counter antihistamine that calms allergic reactions to environmental allergens, insect bites or stings, and certain vaccine reactions. Though it is a human drug and not FDA approved for canines and other animals, it can be given safely with approval from your vet. Benadryl is the brand name, not the name of the drug that treats allergies. There are many other brands that make similar products, and there are other drugs under the Benadryl brand that you must use caution to avoid. Read the ingredients of the medication before giving it to your dog. Diphenhydramine is the active drug in Benadryl that is safe for canines. Cetirizine may also be present, and while it may be safe, there is no need to expose your dog to it if it isn’t necessary. Some products also contain Acetaminophen and Pseudophedrine, which are not safe for dogs. Do not use these products, as they are toxic. The general dosage guideline for dogs is 1mg of Benadryl for every one pound of body weight. You should always consult your veterinarian, as there are a number of factors that can change this dosage recommendation. The average dosage included in one Benadryl tablet is 25mg, so a 25-pound dog should be given one tablet. Check the dosage on the package, and don’t assume that every product will be the same. Stick to the pill form, as the liquid form contains alcohol, which is toxic for dogs. For small dogs, you may wish to use the children’s formula, which has less of the active ingredient and may be easier for you to measure out. The children’s formula of liquid Benadryl contains no alcohol. There is also a topical form that can help with itching. 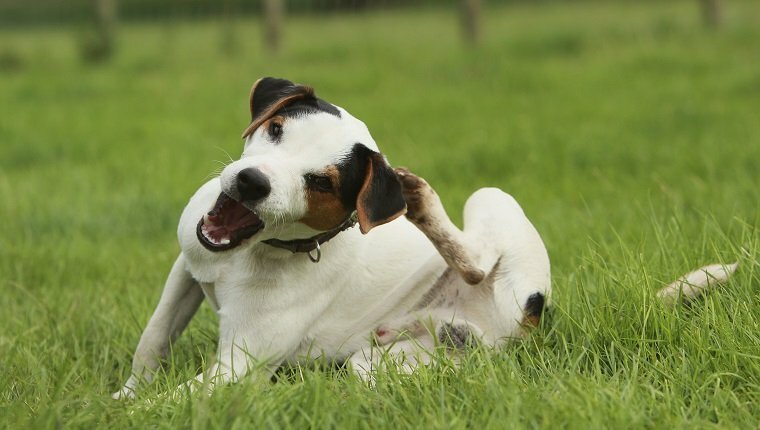 Follow your vet’s guidelines for any creams or gels. Benadryl can be given to your dog every 8 to 12 hours, so about two to three times per day. If you use the product frequently, it may begin to lose effectiveness over time. In most cases, it is better to administer medication before exposure to allergens. Follow your veterinarian’s guidelines, and if a regimen is recommended, stick to it for the duration of your vet’s advisement even if symptoms seem to disappear. It is important to follow your veterinarian’s guidelines strictly. Symptoms of an overdose of Benedryl in dogs include rapid heart rate, dilated pupils, agitation, constipation, and seizures. These symptoms can be life threatening. Some dogs may also have an allergic reaction to the Benadryl itself. Always keep an eye on your dog after their first exposure to the medication. Benadryl reduces many of the symptoms of allergic reaction in dogs, including inflammation, watery eyes, headaches, itching and sneezing, and other symptoms. These reactions can come from a variety of sources, including environmental or seasonal allergens, stings and bites from insects, or medications and vaccines. Because the active ingredient, Diphenhydramine, is similar to the active ingredient in Dramamine, it can be used to treat feelings of nausea and travel sickness. It is sometimes recommended before flights or car rides to reduce symptoms. The sedative properties of Benadryl can also make it an effective treatment for anxiety. Some owners use it during high-stress situations like fireworks or storms that may induce an anxiety attack. Insomnia can also be treated with Benadryl, as it often helps the user fall asleep. The side effects of Benadryl in dogs are similar to the side effects humans might experience with the drug. These include sleepiness, dry mouth, sluggishness, or urinary retention. Some less common side effects that may appear include diarrhea, vomiting, rapid heartbeat, breathing problems, or loss of appetite. You should call your veterinarian if these symptoms become severe. There are some times when you should avoid Benadryl. Puppies may not be able to safely handle the drug, so ask your veterinarian. 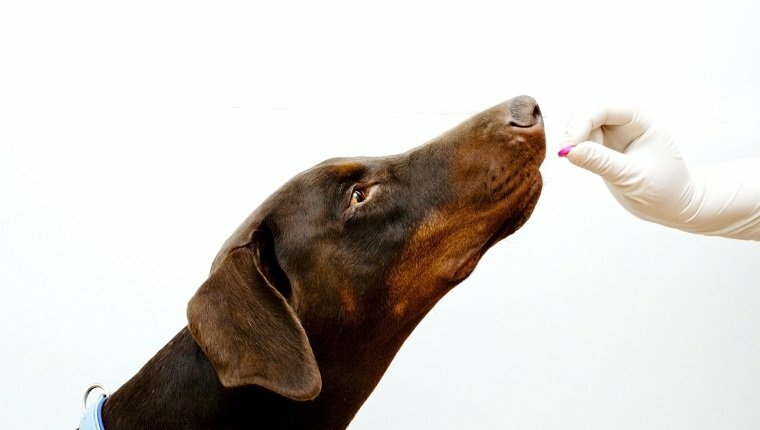 Combining medications can also cause serious side effects, so if your dog is taking any other drugs, make sure your veterinarian is aware. Dogs that currently have, or have had in the past, certain conditions, including heart disease, lung disease, glaucoma, high blood pressure, an enlarged prostate, bladder issues, or a previous bad reaction to Benadryl should not be given this medication. Dogs that are pregnant may see complications, as well. 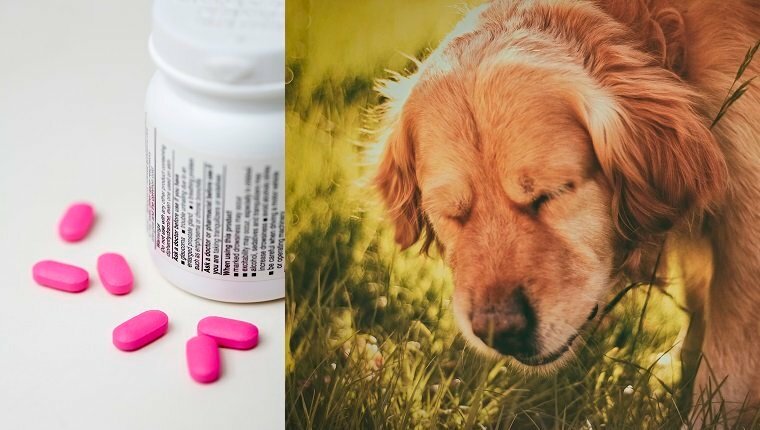 If your dog cannot take Benadryl or you wish to avoid certain side effects, you may consult your veterinarian about alternative medications, or you may find a natural approach to fighting the symptoms of allergies to be preferable. You should still ask your veterinarian if you decide to treat your dog with natural solutions to be sure of proper dosages. Does your dog suffer from allergies? Do you use Benadryl or another product? Let us know in the comments below!